Patients with bleeding disorders such as Haemophilia, Von Willebrand disease, Rare bleeding disorders and Platelet function disorders are registered with a Comprehensive Care Centre (CCC) for the treatment of these conditions. The CCCs are in St James's Hospital and Cork University Hospital for adults (>16 years old) and in Our Lady's Children's Hospital, Crumlin and Cork University Hospital for children ( < 16 years old). There is a Consultant Haematologist and Specialist Registrar available for advice 24/7 in the CCCs - in an emergency, contact the hospital switchboard and ask for the Haematology doctor on call : SJH 01 4103000; CUH 021 4546400; OLCH 01 4096100. All registered patients with bleeding disorders in Ireland should have a registration card which shows their diagnosis on the front and the contact details for their CCC on the back. If a patient attends an Emergency Department for any reason, they should be asked for their registration card. In CUH, please Contact the haematology Registrar on call when the patient arrives. 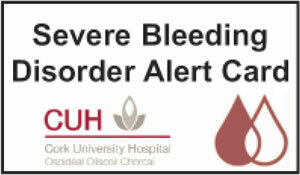 If a patient presents to an emergency department in Cork with a similar card or a history of bleeding disorder, please contact the coagulation centre in CUH on (021)4920347 (via switchboard out of hours) and ask for the doctor on call for Haematology. Identify site of bleed and assess clinically. All bleeds or suspected bleeds must be treated immediately prior to any other investigations. Check medical records and with patient for type of factor deficiency. A 50kg patient with FIX level of 25% needs a rise to 100%, therefore rise required = 100 - 25 = 75%, FIX dose required = (75 x 50) / 0.8 = 6,125iu ~ round to 6,000iu rFIX concentrate (Benefix®). Haemarthrosis / muscle bleeds - 90µg/kg (4.5KIU/kg) every 2 hrs for 3 doses. Major bleeds i.e. CNS and Illeopsaos bleeds - 90µg/kg (4.5KIU/kg) repeat 2 – 4hourly until bleed resolves. Tranexamic acid (TXA) - Cyclokapron - may be used for mucosal bleeds in conjunction with factor concentrate. TXA infusion guide. VWD= A quantitative &/or qualitative defect of von Willebrand factor. Treatments: Tranexamic acid (TXA), DDAVP or Wilate (vWF concentrate). TXA infusion guide. Content by Dr Clodagh Ryan, Consultant Paediatric Haematologist, Dr Íomhar O' Sullivan 01/09/2008. Last review Dr Susan O’Shea, Dr ÍOS 22/11/18.